The fruit of Agnus castus (full name Vitex agnus castus also known as Chaste tree berry) has traditionally been used for the treatment of hormonal imbalances in women linked to premenstrual tension and the menopause. It is one of the few herbs that have been fully researched with a double blind, placebo controlled, randomised trial by R Schellenberg which was published in the BMJ in January 2001. The study looked at women’s self assessment of irritability, mood alteration, anger, headache, breast fullness, and other menstrual symptoms including bloating. It’s main conclusions can be summarised as “extract of agnus castus fruit is an effective and well tolerated treatment for the relief of symptoms of the premenstrual syndrome”. 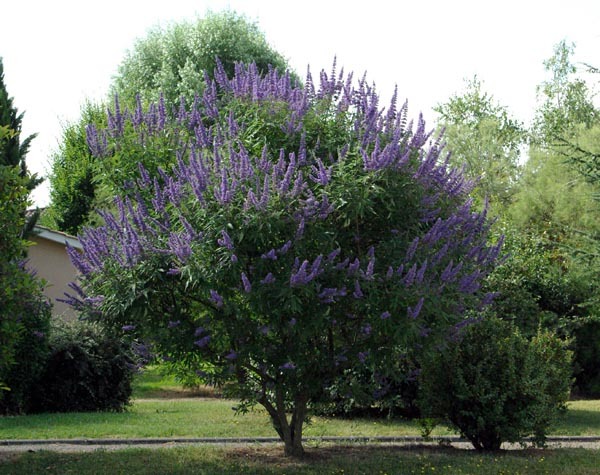 The article was published in the British Medical Journal but it appears that few doctors suggest or prescribe Agnus castus for PMT. That could be because they receive most of their information regarding advances in healthcare from drug companies or possibly because, as it is a herbal remedy, it is dismissed as old fashioned quackery. A review study looking principally at Mastodynia (breast pain) by Wuttke et al published in Phytomedicine 10 2003 concluded “dopaminergic compounds present in Vitex agnus castus are clinically the important compounds which improve premenstrual mastodynia and possibly also other symptoms of the premenstrual syndrome”. Daniele et al at the University of York conducted a “Systematic review of adverse advents” linked to Agnus castus in 2006. They found that adverse events following agnus castus treatment are mild and reversible. The most frequent adverse events are nausea, headache, gastrointestinal disturbances, menstrual disorders, acne, pruritus and erythematous rash. The authors concluded from the available data that agnus castus is not associated with serious health risks, although further rigorous studies are needed. MD Van Die et Al conducted a review of Vitex agnus castus in the treatment of Menopause related complaints in the Journal of alternative and Complementary medicine 15 8 2009 They concluded that, “while evidence from rigorous randomized controlled trials is lacking for the individual herb in this context, emerging pharmacological evidence supports a role for V. agnus-castus in the alleviation of menopausal symptoms and suggests that further investigation may be appropriate”.